During the final Ghost Walk tour for September 21, 2013, group #4 was in the final stage of the tour. The group entered the Staff Lounge which is upstairs in the building. This group consisted of several new patrons but many return Ghost Walkers. Included in the group were Ursula Krentz, Tiffany Kennah and Kenedie Grant. Ursula and Tiffany are regulars at our Ghost Walks. We are so pleased to have them join for they have a real interest in finding the truth. Kenedie Grant has long been a volunteer for the library and has worked many a Ghost Walk in the past. For this particular evening she was a participant not a tour guide. Many times it seems that the spirits “know” us and the regulars that attend. Ursula and Tiffany do seem to attract activity often. It seems when they are in the building the spirits are somewhat drawn to them. Ursula has a love of ghost hunting and she brings her own equipment when attending any event. Generally she reports feeling something walking with her or touching her. Tiffany too reports feelings of spirits around when on the hunts. Often before a tour is started they will turn on their equipment as we prepare and the KIIs or EMFs will begin lighting up and sounding off. Kenedie has worked many Ghost Walks, Zombie Proms, Poetry Jams, etc. for the library. She has been a huge help. Because of her familiarity with the library and the spirits with her it is only logical that she would be welcomed by the spirits here. She is a friendly person and is always open minded. Because of this we feel the ghosts are attracted to “light”. Friendliness can also be viewed as light and therefore it is not unlikely that she might be someone that a spirit might touch. The videos were taken with an IPhone owned by Ursula but videoed by Bianca Jorgensen. Once activity was noticed in the restroom part of the Staff Lounge the door was opened and Bianca began recording what we were witnessing. Everyone in the room saw and heard the devices show that something or someone was with us. Please view the videos taken in the Staff Lounge while on the final tour of the night. Please notice in the second video clip Kenedie seems to have her hair stroked by some unseen hand. Her reaction was amazing. She is someone that is used to activity and this was evident enough to startle her. *Special thank you goes out to Ursula Krentz for sharing her videos with us. Also a special thank you goes to Kenedie Grant and Tiffany Kennah for being such good sports and to Bianca Jorgensen for recording the action. Why Should I Do a Ghost Walk? You may not be a believer in the supernatural. You may never have seen or heard anything strange. 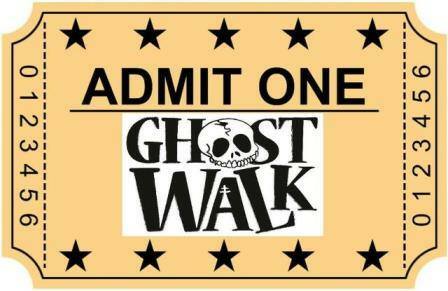 A Ghost Walk may be your chance to see for yourself if the paranormal exists. The Sweetwater County Library hosts Ghost Walks for the public to join in on an actual paranormal investigation. By purchasing a ticket, you are then able to attend and see what can happen while in the library. Because the Ghost Walks are the “real deal” and not a spook alley, the group will use the ghost hunting tools to try to gather evidence of the paranormal kind. We provide KII’s, EMF Detectors, laser grid lights, a ghost box, thermal mat, etc. Patrons are allowed to use their cell phones (in silent mode) to record EVP’s or take photos. Cameras and recorders are allowed as well. Any larger equipment must be approved before hand. I have been asked recently why I believe in the supernatural. For me the answer is easy, because I have seen it for myself first hand. May people are skeptics and most people have to experience things for themselves. Since I started working at the library back in 1992 I have had strange things happen. At first it was noises or shadows. The staff would tell stories of occurrences and I was curious. As time went on I noticed smells and more prevalent movement in the stacks. At one point two of us heard the piano play twice. It wasn’t a song but notes being played. It has been 21 years for me as an employee of the Sweetwater County Library. I love the work I do and my job. One thing is for sure, I will never get bored. The regular library work keeps me busy but the Ghost Log, High Spirits: the Ghost Log Blog, and Ghost Walks keep me doubly busy. So many of you have been gracious enough to stop by and share your stories and evidence. This all takes a good share of my time to compile. It is amazing to me that so many still question if the library has activity. One staff member not long ago had their first “AH-HA” moment. This is where they for the first time realize that something very unusual has been witnessed. You can see it in their eyes that they are thinking “AH-HA”. I will never forget the first time I was hosting a Ghost Walk and I had a moment like that. I had seen things, heard things, etc. but that night was the first night we had a KII meter with us. My son had purchased one for me for a Mother’s Day present. I know, go ahead and laugh. As we entered the Lady’s Room and started asking questions it began to light up. I too had another “AH-HA” moment. We are always learning as we go. Ghost Walks are intended to teach, to share information. We are not here to convince you that the library is haunted. We are here to inform you of what information we have and we provide you with the opportunity to join a Ghost Walk so that you may also see for yourself.